When we think of signaling for help in distress, we tend to think of fires and smokes. That’s why most of us are loaded on fire-starting devices – from primitive ones like sticks and stones to modern ones like instafire and waterproof matches, we have them all stocked in our ultimate bug out bag. Yet when things get tough, fire can turn out to be a heartbreakingly inadequate signal; you could be stocked on sticks and stones for a blazing beacon, and find out the weather’s too wet to get a fire going. That’s why knowing alternative methods to call for aid is such a valuable skill to have when disaster strikes. The tools you can use to signal for help are various, and your survival kit should include more than one. Here are five tools that can help you signal distress when the most widespread fire-creation techniques fail. Whistles make for one of the best audible distress signals in existence – they’re light, they’re loud, they’re long-lasting, and they hardly take up any space in one’s survival bag. Follow the internationally-recognized rule of threes when using a whistle: three short blasts, spaced five seconds apart for effective reach. You might want to attach your whistles to rings or clips to make sure you don’t lose them. Make sure to choose vibrant whistles that can be spotted easily if accidentally dropped, just in case you still lose them! A historical staple, the hand-held mirror is a simple but highly effective signaling device. Aimed right, it can create a beacon as long as 10 miles, catching the attention of people and aircrafts. It’s also a good way to scare off creatures that fear the light, especially when you can’t get a fire going. However, using a mirror to create a flare is a skill you need to practice in advance, to make sure you use it right when things get tough. Replace your regular pen with a pen flare, and you never know when you’ll be glad you made the small but significant lifestyle change. In terms of signaling distress, the pen flare offers an excellent combination of effective audio and visual signaling – when fired, the pen-shaped device sounds like a pistol, while flashing a fire up to 150 meters high. The pen flare’s lanyard can even double as tinder if you need to start a fire when in a tight spot. That’s thrice the protection, in an item that takes up very little space, and is light enough to even be worn around your neck! A midsized or pocket strobe light is always a great addition to a well-planned survival kit. Leave it switched on, and this lightweight device will create continuous flashes for hours, even while you rest or sleep. Depending on the model, strobe lights can even last for a couple of days when fully charged. Make sure you purchase a waterproof strobe light, making it an ideal addition to your survival kit for the literally rainy day. This might sound somewhat unconventional, but today’s smartphones can do a lot more than just make and receive calls – they can save your life when you’re in a pinch. If fire fails you, just turn on your phone torch; in 2012, a Maryland man actually used his iPhone’s flashlight app to help police find him in the pitch dark, after the rescuers had spent four hours searching for the missing man to no avail. Your cellular phone can also help you pin down and track your location through GPRS, as well as forward it to others. Of course, your phone won’t be much use if it isn’t charged. So always carry a fully-charged power-pack, to make sure your communication gadget’s life-saving powers can last! With these five additions to your bug-out bag, you will have a personal protection kit that won’t fail you when you need to signal for help, come hell or high water. 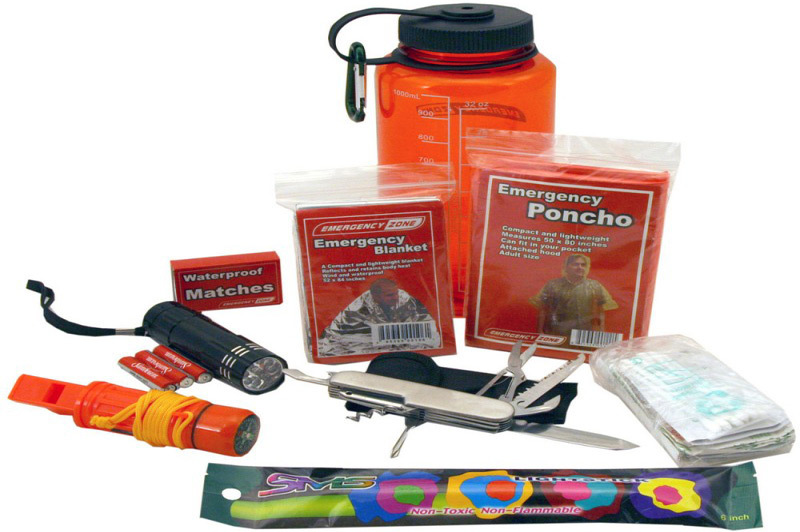 Rain, slew, snow, heat, and zombies – together, these five items can fight them all. When the going gets tough, the tough get going; so add these items to your survival kit right now, and ensure you’re prepared to handle the worst of times, well in advance. James Smith is a survival expert, who loves to write about survival skills and techniques that can be extremely helpful and can prevent any bad situation in becoming worse. Follow him on twitter @jamessmith1609.